What are the most valuable degrees? The most valuable degree you can do is economics, and the least valuable is health and social care. At least according to the latest research by the IFS on the impact of Higher Education on future earnings. 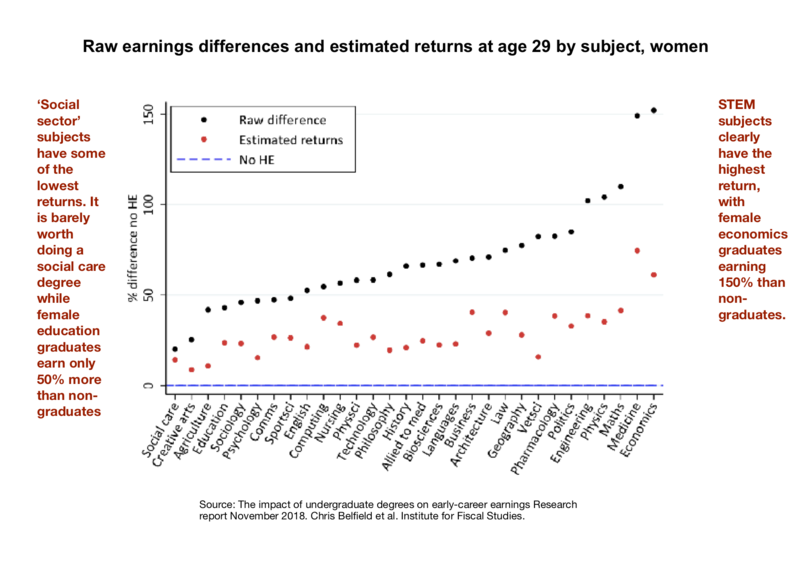 The table below compares earnings at age 29 of female graduates compared to non graduates for different subject areas. As you can see, female economics graduates earn 150% more than non graduates, with medicine not far behind and most of the rest of the STEM subject graduates earning 100% more. Meanwhile at the other end of the scale social care and create arts degree graduates only earn about 20-25% more than non-graduates, making these degrees a lot less valuable in terms of purely financial returns. Fair enough I guess that medicine yields a decent return, I don’t think there’s much scope to criticise that, and given the innovation within science and engineering, the fact that these degrees result in 100% higher earnings at age 29 isn’t surprising either. HOWEVER, I have a problem with economics graduates earning so much more. It’s very unlikely that these people are earning so much money because of the social good they are doing. It’s probably more likely that they’re sucking money upwards to the already rich working for corporations and hedge funds, or doing crude econometric (read ‘guess work’) analysis for large institutions like the World Bank. They’re reward is probably making the rich richer, or at least keeping them rich. Meanwhile down at the bottom, I’m not so sure whether the low return on the caring degrees shows how little we value this qualitative side of life, rather than the fact that degrees in such subjects maybe can’t teach you that much?!? I mean with caring, how much is there that you can’t learn on the job, honestly, or just learn at level 3. Don’t get me wrong though, I think caring professions are very much underpaid. As to creative arts… I’m not sure whether these are undervalued, difficult for me to say with any level of objectivity, although if these stats are anything to go by, it shows us that ‘society’ doesn’t value art very highly! NB – The figures for men are a little different, check out the above study if yer interested! Men who went to a private school* go on to earn 78% more at age 29 than men who come from the lowest ‘social class’ quintile. Women who went to a private school* go on to earn 100% more at age 29 than women from the lowest ‘social class’ quintile. 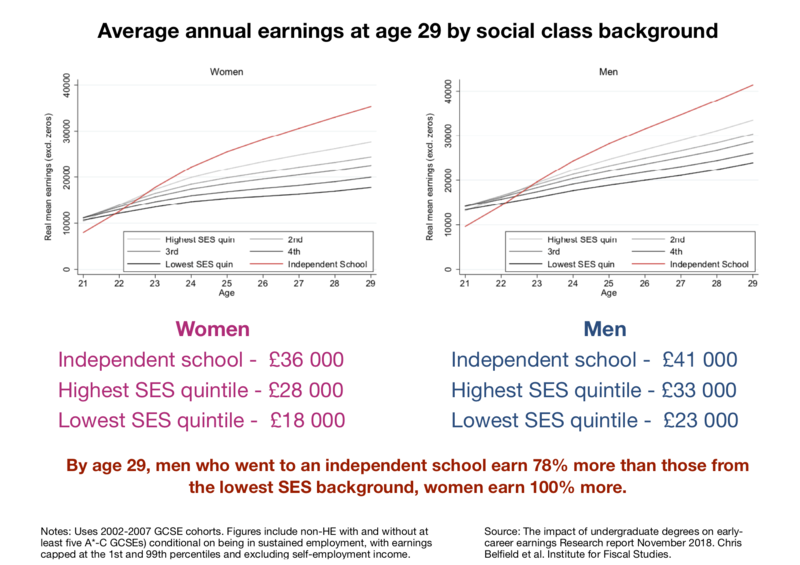 By age 29, men who had been to a private school earn on average £41 000 per annum, compared to only £23 000 per annum for those from the lowest SES background. The respective figures for women are £36 000 and £18000. Those who attended private school even earn considerably more on average than those from the top SES quintile. This is from the latest IFS study on the impact of Higher Education on future earnings. Get a better paid job. It also shows that we need to keep researching exactly how private schools confer advantages on children from rich backgrounds and on just exactly how material and cultural capital combine to get these kids better jobs as adults. You might like to read this post for more detailed info. The above stats show all earners, including those who failed their GCSEs, so we’re not really comparing like with like when we compare highest and lowest SES categories, because so many people from the lowest SES category fail to get 5 A*-C grades at GCSE, which means they are much less likely to go to HE, which has a significant negative impact on their earnings at age 29. With these stats we are going back to a cohort which sat their GCSEs over 10 years ago, so they are already dated, although in fairness, this is unavoidable with a longitudinal analysis such as this. *Given that only 7% of UK children go to private school, and that most have to pay fees, attendance at private school strongly suggests that this is the top tenth decile of students by ‘social class’ background, so the top half of the top fifth. How much more will I earn if I do a degree? At age 29 male graduates earn £13K more per year than those with 5*-Cs without a degree while women earn £10K per annum more. I calculated these figures based on research into the impact of degrees on future earnings at the age of 29 conducted by the Institute for Fiscal Studies. If you look at the wages earned by HE graduates compared to people who got 5 A*-Cs at age 29, then female HE graduates earn £10K more per year before tax, while men earn £13K more per year, again after tax. If we reduce this difference a little to take account of taxation, then we get the figures above: a degree pays back in earnings after just 3 years for men and 4 years for women, at least once they reach the age of 29. All of this assumes tuition fess are £9K a year for 3 years, and doesn’t take into account the opportunity cost of HE students not having earned anywhere near as much for 3 years while studying compared to non HE students. Having said that, I think it’s fair enough to take a long term view, and look at things 6-7 years or so after graduating… a degree is a long term investment after all. My tax calculations are also approximate. NB – the above figures are averages, and there are considerable variations on this depending on the subject you choose to study, and other factors such as your class background. For more info on the study, you might also like this post! The Declining Value of A Degree? More people are doing degrees, yet they are less likely to give us the skills future employers need, so is it worth doing a degree in the first place? Or are you better off saving £50K? Firstly, he cites the increasing number of people who achieve degrees compared to 50 years ago – Today’s degree, in some ways, is like like the old high school diploma. Secondly, despite the increasing number of people with degrees and the increasing requirement to have one to get your foot in the door, almost 40% of U.S. employers report difficulties in finding graduates with the right skills, which means (somewhat ironically) that many of the above degrees are useless in actually preparing people for work. Slayback argues (pretty convincingly I think) that a degree is no longer sufficient to guarantee you a job; he also suggests that it may not actually be worth doing one (and in terms of getting you ready for work, I think he’s right, but not necessarily so in terms of the intrinsic worth of the uni experience and knowledge gained). According to Slayback, in order to be successful, graduates need to get better at signalling their skills through social media, rather than relying on the simple fact that they’ve got a degree to so that for them. He even goes so far as to suggest that the internet itself is actually undermining the value of a degree. He gives the example of a young man who connected with him on Linked In, and through a Google search, managed to get an insight into what he’d actually achieved, which made the fact that he didn’t have a degree irrelevant. Personally I think Slayback has a point about the virtues of social media in signalling your skills – if you’re looking to go into a sector that requires you to produce content in any form, them it’s an obvious idea to have a social media platform where you show off that content, through which you can demonstrate your skills. I’m not so convinced that it’s worth risking not doing a degree, maybe you’re better off doing one, but from day one thinking about how to leverage every essay you write or every project you do into something that you can use in the future to make you more employable…. two birds with one stone and all that…. What reading should you do in order to prepare for studying an undergraduate degree in Sociology? This post recommends some introductory reading that you might like to do over the summer to get ahead before commencing the first year of your degree in sociology, or related discipline. You should read at least the introductory chapter to one of the text books below (preferably the one recommended by the university you most want to go to), to give yourself an idea of the core themes in degree level Sociology. Haralambos and Holborn (2013) Sociology Themes and Perspectives – The section on Globalisation and Late Modern theories are especially good. ‘Thinking Allowed’ on Radio 4 – This is a weekly 30 minute sociology Podcast, which typically covers two pieces of research from two different Sociologists. Their archive is excellent. The London School of Economics blog is more specifically political/ economic/ sociological than either of the above sites, but has some good updates on Sociological research. Bristol is ranked number two for sociology in the U.K. Below I reproduce the University of Bristol’s recommended introductory reading list for its various core introductory courses for 2018, which are the bold headings below. Z Bauman and T May, 2001, Thinking Sociologically, Oxford: Blackwell. R Jenkins, 2002, Foundations of Sociology, Basingstoke: Palgrave MacMillan. N Abercrombie, 2004, Sociology, Cambridge: Polity. Castles, Stephen, and Miller, Mark J. 2009. The Age of Migration: International Population Movements in the Modern World. Basingstoke: Palgrave Macmillan. Cohen, Robin, and Kennedy, Paul. 2007. Global Sociology. Basingstoke: Palgrave Macmillan. Lash, Scott, and Lury, Celia. 2007. Global Culture Industries: The Mediation of Things. Cambridge: Polity Press. Martell, Luke. 2010. The Sociology of Globalization. Cambridge: Polity Press. Massey, Douglas S., Arango, Joaquin, and Hugo, Graeme. 2005. Worlds in Motion: Understanding International Migration at the End of the Millennium. Oxford: Oxford University Press. Gray, A. and Mc Guigan, J. (eds) Studying Culture: an Introductory Reader London: Edward Arnold. Hesmondhalgh, D. (2007) The Cultural Industries (second edition) London: Sage Publications. Strinati, D. (2004) An Introduction to Theories of Popular Culture (second edition) London: Routledge. Devine, F., Heath, S. (1999) Sociological Research Methods in Context. London: Palgrave Macmillan. Gilbert, N. (ed.) (2001) Researching Social Life (2nd edition). London: Sage. May, T. (2001) Social Research. Issues, Methods and Process (3rd Edition). Maidenhead: Open University Press. Robson, C. (2002) Real World Research (2nd Edition). Oxford: Blackwell. Ruane, J.M. (2005) Essentials of Research Methods. Oxford: Blackwell. Seale C.F. (ed.) (2004) (2nd edition) Researching Society and Culture. London: Sage. What’s the difference between studying sociology at ‘A’ Level and studying sociology at ‘degree’ level? In terms of content – Sociology is a lot more diverse at degree level than at ‘A’ Level – Sociologists research very diverse topics and universities have more freedom to set the modules which they teach than at A level. Degree content will thus vary with the specialisms of the staff, and varies enormously from university to university – some universities will be more focused on politics and social policy, and others more on the media and the study of culture, for example. Sociology lot more interdisciplinary at degree level– there is a lot more overlap between Sociology and other subjects such as Anthropology, Development Studies, Criminology, Psychology, and Social Policy. Most students studying Sociology actually combine it with something else. You will need to do a lot more in-depth reading at degree level (this is the case in any social science, or humanities subject). You will typically need to read a minimum of one chapter from a book and one or two other sources which relate to this core reading. In total, this will mean at least 40 pages of reading per module per week, and you will probably be studying 4 modules at a time – so that means 160 pages per week – and you’ll need to add on more for the essays you’ll be doing. You will need to know the knowledge in much more depth at degree level – you will be expected to read and summarise extracts of core-texts each week and be able to critically evaluate these texts in discussion and essays. In terms of skills – you need show greater depth of critical awareness, analysis and evaluation, and be able to demonstrate all of these verbally and in writing, using evidence. You need to more self-starting in terms of reading and writing essays – there is a lot less contact time at university. The London School of Economics – useful to know even if you aren’t likely to get the grades due to its excellent public lecture programme and various blogs.